When Noorudin and Anis Jiwani were in their mid-40s and living in Toronto in the early 1990s, they knew they wanted to slow the pace of their hectic lives and spend more time with their young children. Anis, who was a dietitian—consulting with larger food manufacturers such as Nestle and Campbell’s—had always wanted to own her own business. They decided to put her years of training and experience toward creating a food company that would fill a void that they saw in grocery stores – good, fresh Indian food. After researching three possible locations—the Toronto area, where both had grown up, gone to school and got married; B.C. and Edmonton—in 1999 the couple found two powerful draws that made Edmonton the obvious choice. One, says Noorudin Jiwani, was the Food Processing Development Centre, a pilot plant funded by the Alberta government for up-and-coming food processors. The other was the fact that the provincial government here was willing to finance the invention of a highly efficient samosa-making machine (a spring-roll maker with a few tweaks) that would mimic the painstaking process of making the dumplings by hand. Recalls Jiwani, “We were starting from kitchen recipes and we had to (convert) them into mass production. That is where the FPDC in Leduc was quite an attraction for us.” While taking advantage of the centre’s recipe development support, in 2000 the Jiwanis began working with a staff of five out of a 1,700-square-foot space in Sherwood Park that they outgrew within six months, quickly moving into 3,500 square feet. And that is where they stayed until the Agrivalue Processing Business Incubator opened its doors down the hall from the FPDC in 2007 and Chef Bombay added a suite there to the space they already had. 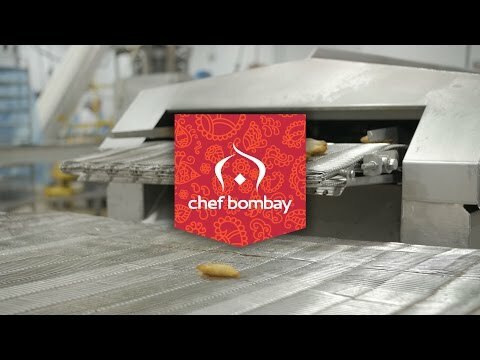 Today, Chef Bombay employs close to 175 people in its own 42,000-sq.-ft. space in Edmonton, where seven of those samosa-making machines pump out more than 300,000 samosas every day. The Jiwanis based the design of their space on the APBI’s blueprint. “When we built our facility, we looked at the blueprint of the incubator,” says Jiwani. “And there were a number of good things there that we were able to use to put our business together.” The family have also expanded their menu to include items such as butter chicken and pakora, and gluten-free and vegan alternatives as well as Halal-certified options. They take pride in using as many Alberta ingredients as possible, including lentils and chickpeas, some vegetables, chicken and beef. Chef Bombay began exporting in 2003, and today 70 per cent of its product goes to the United States. What’s next? “We’ve started to talk to distributors in both Germany and the UK, and we expect that by 2020 we’ll be fully integrated into the European market,” says Jiwani. Chef Bombay, like many other Edmonton food producers, is making its presence known around the world.